DII 100% cotton tablecloths come in a variety of colors & sizes. These tablecloths are perfect for picnics, parties, showers, dinners, fall holidays, Thanksgiving and more. DII offers a variety of designs and patterns, giving you numerous options for your next event or dinner party. All of DII cotton tablecloths have a 1 inch folded hem and mitered corners. These tablecloths are machine washable for easy clean up and use. Find DII full selection of tablecloths by searching for "DII cotton tablecloths". FOR YOUR TABLE - This table runner measures 14x72" in size, appropriate for a table that can seat 4-6 people. 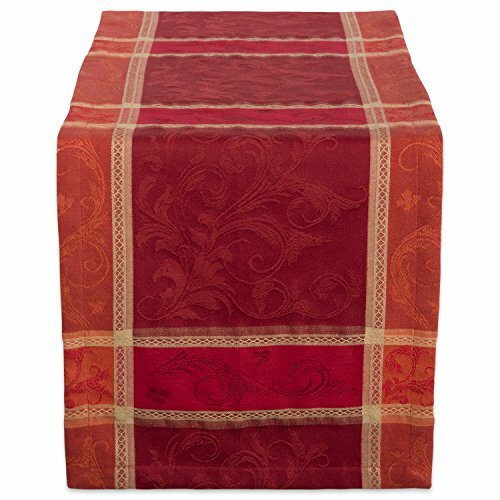 ADDS A FINISHING TOUCH - Use our table runner center lengthwise on your dining table to bring fall joy to mealtime! ENHANCE YOUR HOME - Use all through the Fall season, place lengthwise on console tables, dining tables or entryway tables to instantly update up any room. FOR MORE DÉCOR - DII offers delightful home products including matching cloth napkins, napkin rings, placemats and tablecloths. Click the DII link at the top of the page to explore our collections or search "DII Table Tops". Handmade Hemstitch Design Natural Table Runner. One Piece. 16"x72" Rectangular.